Our launch window opens in ten days – December 4. 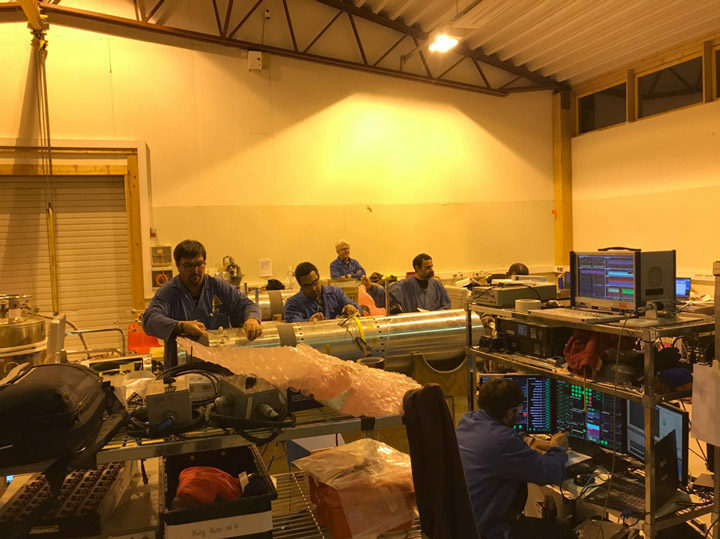 Each day brings us closer to being ready, as we continue the routine of testing and preparations. These are the same steps that we run through wherever we launch our rocket missions, but Ny-Ålesund has its own special atmosphere. Here, without the regular rising and setting of the Sun to bring a sense of duration, the long winter nights can seem timeless. 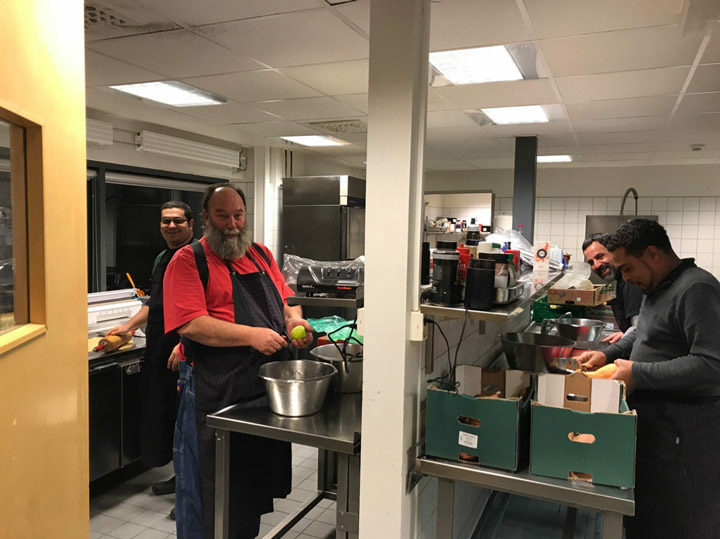 We mark the days instead by our work shifts, blessedly interrupted by common meals warmly prepared by our Kings Bay colleagues at the Servicebygget, where everyone in the town eats together. Meals are different here. There are no cellphones at the tables. This is because the village of Ny Ålesund, and a 20 km radius around it, is in a radio quiet zone — no cellular, WiFi, or Bluetooth. The quiet zone is designed to protect exquisitely sensitive radio antennas that are listening to distant quasars, one of many experiments ongoing at this scientific oasis. The meals are not quiet, however. People are focused on each other; on the food and conversation. Most meals have varieties of fish and potatoes, but there is also delicious homemade bread, fresh fruit (in high demand) and fresh vegetables. There’s always a smörgåsbord of cheese, meat, and relishes of various kinds, and cookies, pudding, or mousse for dessert. Every weekday, we have three meals together, and on the weekends two, with Saturday dinner a special “dress-up” event, with candlelight, when one can bring wine or beer to share. In between the meals, we walk. A lot. The town has roads and plank walkways, laid down to protect the pristine tundra. Ny-Ålesund takes its stewardship of the environment seriously. There is no litter in the street, and it is forbidden to walk on the bare tundra, to protect the delicate ecosystem. There are few vehicles, mainly only for service and cargo handling. A few of the residents get by on bikes, but mostly people walk. The roads are typically covered in ice, so we wear spikes on our boots. For the first week or two, before the spikes, many of us were slipping, sliding, and falling, but with the spikes the roads are very manageable. Though there is no sunlight (except a brief twilight glow at noon, and even that is fading as we approach the solstice), there is often enough light from the town and from the Moon, which is currently full and in the sky 24 hours a day. As we approach the launch window, the new moon will arrive, and remain below the horizon most of the day, letting us use our sensitive cameras to capture the faint aurora, and making the polar nights even darker. Usually one can make out the surrounding mountains and glaciers, and the calm waters of the Kongsfjord. There is even an occasional iceberg calved into the fjord, and they stand out white against the dark waters. Besides the moon, our other constant companion is the wind. Most days there is anything from a fresh breeze to stiff wind, up to 35 mph (56 kph). Though the air temperature is in the teens (-5 C), the wind cuts through all but the warmest clothing. We are walking upwards of 1.25 miles (2 km) a day in this wind. 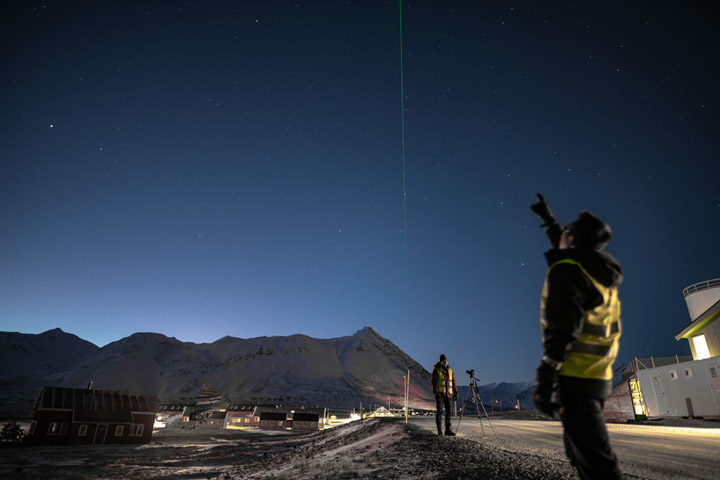 The walk is another time for community, or at least commiseration, and it is also a time to enjoy the austere beauty of the landscape, the aurora, the moonlight on the water, and even the intense beam of the research LIDAR used here to study the atmosphere, flaring into the sky like a pillar of green flame. At one end of the walk is the payload assembly building, where we are testing the rocket payloads and science instruments. Sven, the harbormaster, has graciously offered his garage for the testing of the payloads, and the accommodations are luxurious compared to some other remote sites we have visited. 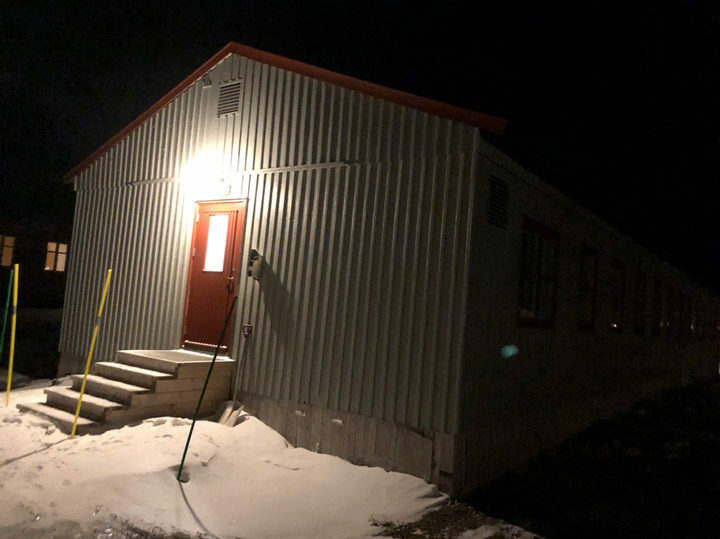 Picture a large warehouse, sixty feet (15 meters) on a side, with a thirty-foot peaked roof. Spread about the floor are workbenches, packing crates repurposed as equipment racks, shipping containers, and the payloads themselves. A large roll-up door lets the trailers in and out, as well as the occasional icy gust. 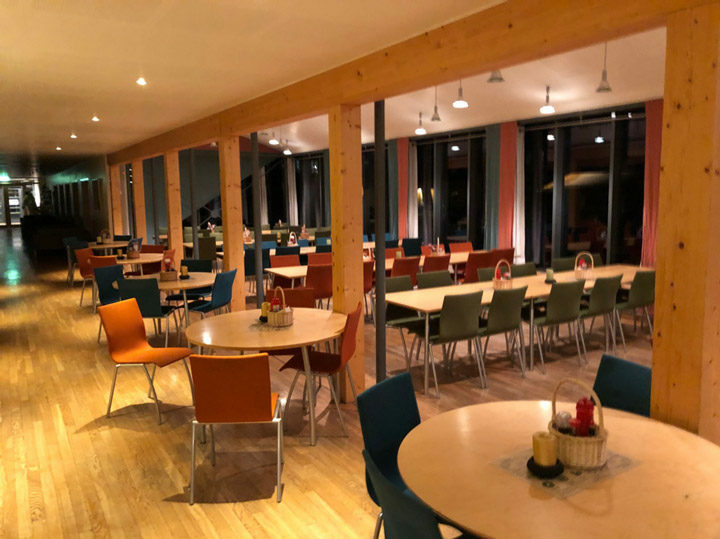 At the other end, our dormitories, the Kongsbutikken (general store), gym, Ny-Ålesund museum, and Servicebygget (mess hall and rec center). All the buildings are unlocked, both for convenience, but also for safety in case a polar bear visits the town. 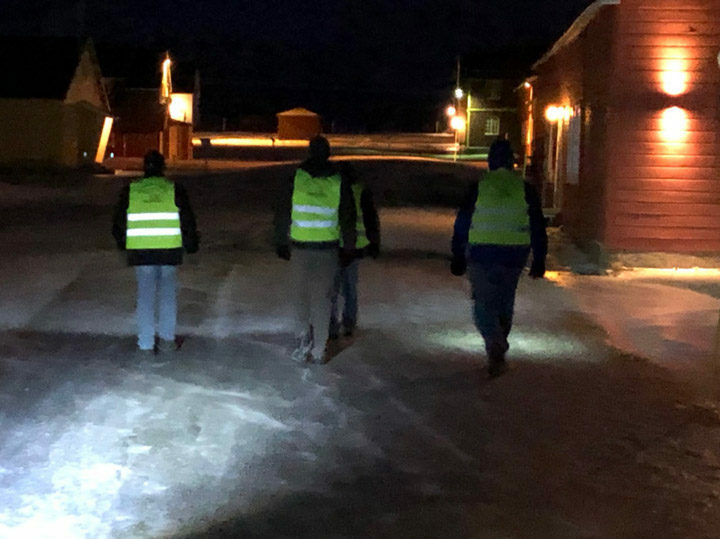 In each building, we remove our boots and wear slippers or indoor shoes, to keep from tracking in the ice and snow (or scratching the floor with our spikes!). 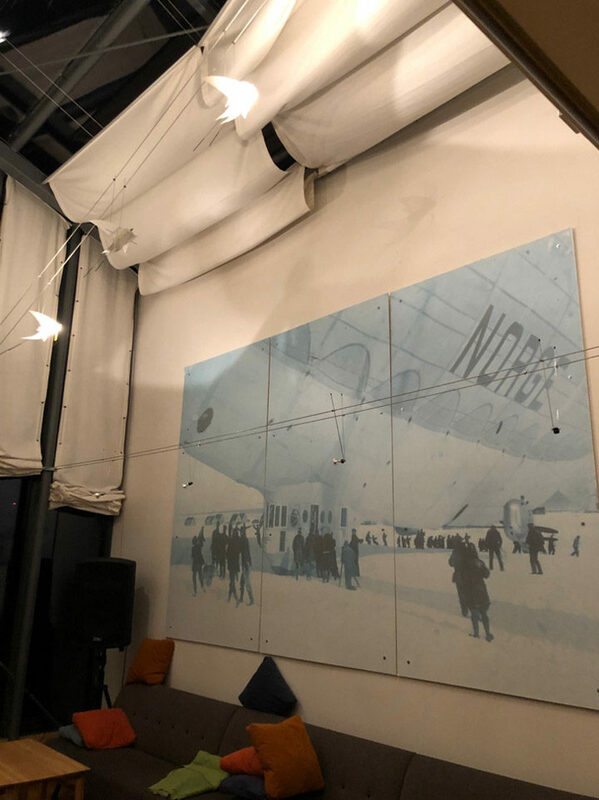 The “Velferden” system here includes a cozy cafeteria and common area, recreation area with pool and foosball, and a dancehall themed after Roald Amundsen’s flight of the Norgeairship to the North Pole, soon to be the site of the world’s northernmost karaoke party. Tonight, the Norwegians have kindly offered to help us celebrate Thanksgiving with a formal meal, and some of the NSROC staff have been helping with recipes and with the food preparation. We’re all looking forward to a taste of home as we move into a day off tomorrow before completing the payload preparations next week. This entry was posted on Saturday, November 24th, 2018 at 2:43 pm and is filed under VISIONS-2: Imaging Earth’s Portal to Space. You can follow any responses to this entry through the RSS 2.0 feed. You can skip to the end and leave a response. Pinging is currently not allowed. I enjoyed reading. Gave me a different perspective. Thanks. This is really fascinating! I’ve wondered what life is like in that part of the world and with your narratives and pictures I now have some idea. Keep the updates coming and thank you!